MongoDB provides a User Management Interface for performing a wide variety of user-related tasks. In addition to adding new users, the User Management Interface also allows database administrators (DBAs) to update existing users, such as to change password and grant or revoke roles. In today's blog, we'll explore how to create a new user using Navicat for MongoDB's User & Role Management facilities. It's important to know what happens when you create a new user in MongoDB. The user's data is inserted in a specific database called the authentication database. Moreover, MongoDB stores all user information, including name, password, and the user's authentication database, in the system.users collection in the admin database. The user's name and authentication database together serve as a unique identifier for that user. Therefore, if two users have the same name but are created in different databases, they are considered to be two separate users for all intensive purposes. Hence, if you intend to have a single user with permissions on multiple databases, you should create a single user with roles in the applicable databases instead of creating the user multiple times in different databases. Regarding privileges, these are not limited to the user's authentication database, but can extend across different databases. 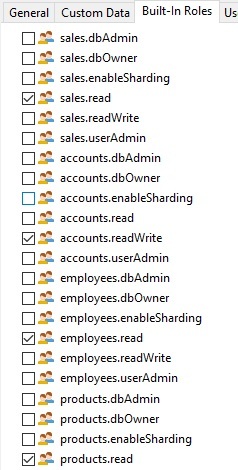 By assigning to the user roles in other databases, a user created in one database can have permissions to act on these databases. DBAs should not access the system.users collection directly, but instead use MongoDB's user management commands. Creating a user is accomplished using the db.createUser() method or createUser command. The user name, password, encryption specification. In this tab, you can enter any information associated with this user. In the list, assign this user to be a member of the selected built-in roles. In the list, assign this user to be a member of the selected user-defined roles. To edit specific authentication restrictions that the server enforces on the user. Displays the native MongoDB command(s) that will be executed. Specify a login password for the user. Re-type the login password in the Confirm Password field.